No matter how carefully you proofread and test patterns, errors do occur. Here are the ones that have been found. Table 4 First three column headers are incorrect. Queen/King and CA King are correct. 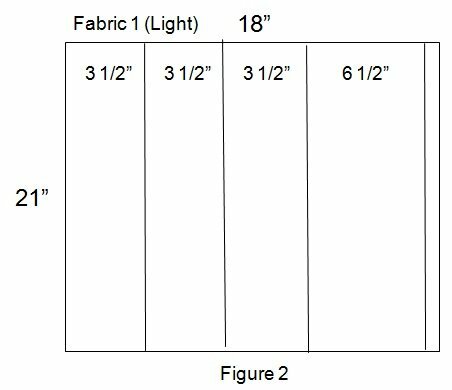 (add table to bottom of page) Click here for Border Fabric Cutting Info table(pdf file). Fat Quarter Fun, Trois DLQ-22 Page 1, Step 1, 1a. Page 1, Step 1, 1b. Page 3, Step 2, 6. Page 3, Step 2, 7. Change "Cut one strip" to "Cut three strips". Change "Cut two strips" to "Cut one strip". Replace Figure 2 with this corrected figure. Remove the word "five" from "cut five 3 1/2". 1 1/8 to 2 1/8. Florentine Stars DLQ-20 Page 7 Change page number from 7 to 5. Garden Reflection DLQ-16 Click here for errors. Suggested Block Layout) Replace the lap size suggested block layout with this corrected layout. of item 2 Replace text reading "squares of Background fabric" with "squares of Supporting fabric"
Replace text reading "Usinge remaining layered " with "Using the remaining layered"
Zandra's Choice DLQ-23 Click here for errors.